With approximately 180 rental properties for students and market-rate renters, Columbus-based Hometeam Properties has one of the largest selections of single-family homes for rent in The Ohio State University district. Outside the campus area, they also own and manage multiple single-family homes around the Columbus area, including in German Village, Whitehall and Reynoldsburg. 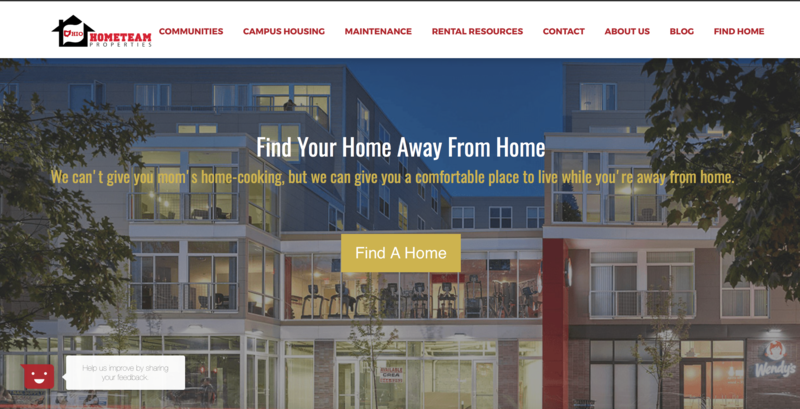 Following changes in policy by The Ohio State University that now mandate a 2-year campus housing minimum for students, management at Hometeam Properties wanted to maintain their current status as the leading off-campus housing provider for OSU students. The University Housing Regulation and University Housing occupancy requirement requires that all unmarried undergraduate students who are regularly admitted and in full-time attendance must live in university residence halls while enrolled at The Ohio State University, Columbus, or ATI campus. This changed the rental landscape for Hometeam Properties, as there was now a large gap in the number of students looking for off-campus housing. For the first time in company history, the company was showing multiple vacancies across their rental property footprint in and around campus. In order to help Hometeam Properties adjust to their new landscape, we developed an actionable and comprehensive inbound marketing and sales strategy. This started with a full implementation and onboarding of HubSpot’s Professional marketing automation system and sales system. To make sure this system implementation was successful, we gathered the Hometeam team for a kick-off session that would teach them the key fundamentals of inbound marketing and how they could use the tools to create a strong strategy. In order to keep the team informed, we provided them with ongoing strategic guidance, coaching, and education to the members of Hometeam’s internal staff. This helps them to effectively execute the inbound marketing and sales methodology in a way that will help them continue to reach their sales goals. From there, Hometeam underwent a full website redesign and migrated their website to HubSpot COS. To maintain the site, we created and tested up to three Customer Driven Design hypotheses per month. By using tools like HotJar, we were able to see how users were interacting with the site and make changes to it accordingly. 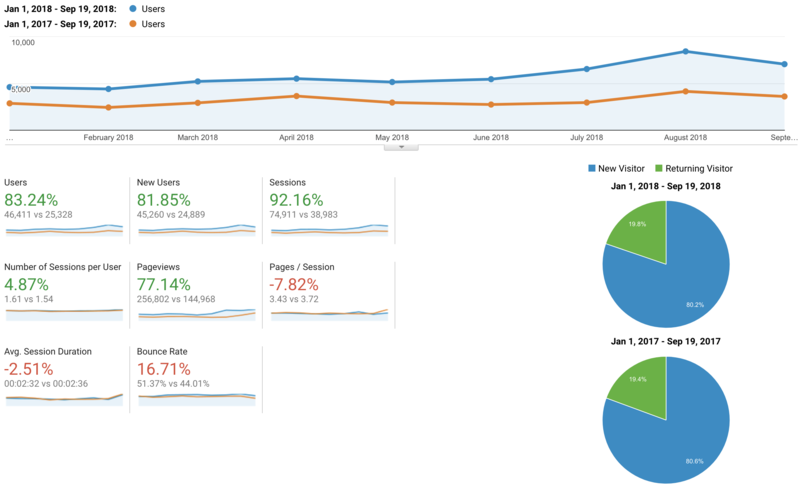 After the site was migrated to HubSpot’s COS, we went to work fully developing and optimizing more than 180 landing pages for the properties that they had. We also migrated multiple luxury property microsites for non-student housing options into the main website and HubSpot COS. This has been an ongoing process. Content activation was another key part of Hometeam’s process and journey to becoming a trusted name for off-campus housing. In order to do this, we worked with them to create and deploy up to two unique, persona-centric premium content offers annually. This included things like a budgeting calculator for students. To full utilize HubSpot Sales Pro, we trained Hometeam’s leasing agents on how to use the deals pipeline for full transparency and tracking of any leads and closed leases. This included the set-up of a custom deals pipeline that fit exactly what Hometeam needed for their internal sales team. By the end of 2017, Hometeam Properties increased the sessions and page views on their website by more than 600%. They have seen significant increases in overall site interaction numbers. Another key part of Hometeam Properties' digital process is executing a consistent Facebook Advertising strategy. In 2017, we helped Hometeam deploy 14 Facebook campaigns that utilized various audience targeting strategies as well as A/B split testing. They reached over 64,000 people, had over 94,000 impressions, and averaged a cost per click of $1.50. Since its launch in September of 2016, Hometeam’s website has generated more than 589,000 page views. Hometeam is currently indexed for 114 keywords on page 1 of Google search results, which have brought in over 3,220 new contacts and 144 customers from organic search. With the use of HubSpot technology, Hometeam’s sales team has moved away from manually tracking sales on spreadsheets to fully adopting HubSpot CRM to nurture MQL’s to closed tenants with full pipeline visibilty. In the 2016-2017 leasing period, Hometeam had 100% of their properties filled and had no vacancies. Through training within HubSpot, Hometeam now utilizes a keyword strategy and regularly produces blog content that caters not only to students, but their parents, as well as market-rate renters. Hometeam has executed a steady Facebook advertising strategy and has generated 327 leads from Facebook advertising alone.